1) It showed the importance of punctuation. However, the book was nothing but a weird mixture of the two. On the one hand, the author made it very clear that she considers punctuation endlessly important, but never mentioned just why it was important in more than two parroted (from other books, writers, grammarians) sentences. 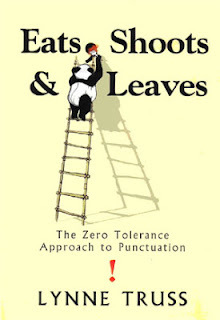 On the other hand, the book never fully taught the rules of punctuation, either. It only gave examples of ridiculously funny signs and boards, with all the wrong punctuation marks in all the wrong places; and the author went on to poke fun at the people who might have written them! Her condescending tone and her misplaced self-importance irritated me immensely. You can't blame those who don't know the correct use of punctuation for never having learnt it. You can say that you think they are wrong in assuming that it is unimportant, tell them why you think that, and correct them. Right from categorizing herself as a case of exceptional genius and stating "While other girls were out shopping and making out, I bought books on grammar." to the constant jabs at grocers and teachers, there were far too many stereotypes for my taste. The author also often mentioned her distaste for people who go out of their way to endorse bad grammar and spelling on the Internet and in text messages, but isn't the lack of good language in the virtual world "old news", so to speak? Not to mention, in almost each of these so-called jokes, the author ended up throwing in a short explanation, which any true grammar lover would not have needed and which any person who had not understood the joke in the first place would have found too short. It seemed like she was thinking: I should probably explain the joke, just in case some self-proclaimed stickler doesn't understand it, and feeling put down, stops reading my book. That is another reason why I didn't like this book: it's the least honest book I have read in a while. The book was very disconnected and I had the impression that the author was herself not quite sure what she wanted to say: the parts about the art of punctuation and her general dislike of emoticons seemed abrupt, out of place and frankly, quite unnecessary. The book was, like I said before, a whole big pointless mildly funny rant. Sigh. Those were four hours of my life I'll never get back. If you like grammar or humour of any sort, do yourself a favour and stay as far away from this book as you can. This might seem like another rant too, which it sort of is. But it's just a bad review on my blog, not a book that claims to be a lot more. If I were to write a book, it would be nothing like this. No. I would never write a book about mistakes, I'd rather be a teacher. hahaha, that was a fun review!! well, i don't read books primarily because i am a forced reader. but why did you read the entire book? i would have thrown it away after reading one paragraph and would never have touched it after that. i loved this review, every single line of this. I guess I am a compulsive book-finisher. Also I was kind of hoping it would redeem itself by the end, but it never did! I so wanted to read this book. :( . Not anymore. Pratyush - It honestly isn't worth it; but I'm sorry to disappoint you!